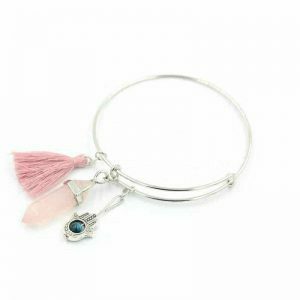 This silver bangle bracelet has a pink natural stone as a pendant, a tassel and a hamsa hand charm. Wear this bangle bracelet together with other nice bracelets for an arm party. Combine it with other silver jewelry. For example with a beautiful long necklace or silver stud earrings. A subtle, fine necklace would also be nice. Do you have questions about the silver bangle bracelet with beautiful charms? Send us a message. Give your outfit a cool touch with this black choker necklace. 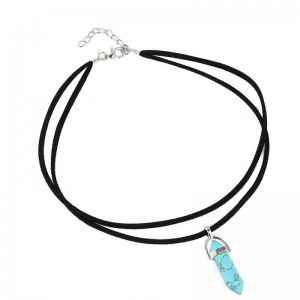 This beautiful choker necklace consists of two layers. A small blue natural stone hangs on the second layer. Combine this stylish choker necklace with other nice jewelry. For example with a nice bracelets set or with a nice ring. Do you have questions about this black choker necklace with blue natural stone? Feel free to send us a message. 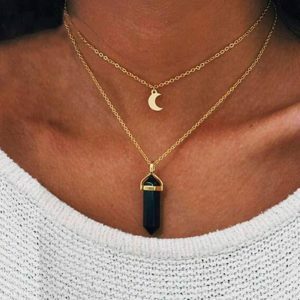 Layered necklace are super nice! We love it! This layered necklace consists of two layers. On one layer there is a small golden moon and on the other layer hangs a black or white natural stone. Combine it with other beautiful gold jewelry. 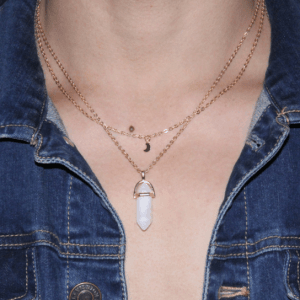 Wear this necklace together with our moon ring and you are ready to go! Do you have any questions about the Layers Necklace with Black or white Stone and Moon? Send us a message.